Lindsey Augusta Mercer really has turned into one of the cities premier young directors. She is very specific about style and look – and actors always tell me that they love working with her. She’s very busy and its easy to see why as her latest production, this time at Falcon Theatre, is top-notch. THE MYSTERY PLAYS by Roberto Aguirre-Sacasa is a curious piece of theatre. As Mercer says in her director’s notes, this play is “structurally inspired by the medieval tradition of small acting troupes in England that traveled cross-country in a wagon, performing stories from the Bible.” This ensemble is small – but mighty – and the two stories they tell are far from Biblical, though they are no less epic. Both stories are hosted by a very creepy Leah Strasser. The first half of the production focuses on burgeoning filmmaker, Joe Manning (Adam Jones) who meets a stranger on a train (Simon Powell) and finds himself in the midst of a supernatural horror mystery. After intermission, things become more serious as we learn the story of Abby (Becca Howell) and her very troubled brother (Jared Earland), and their journey together through an abusive childhood and even more tragic family murder. Rounding out the cast is the very good Nicole Jeannine Smith, who like the rest of the troupe, plays multiple characters. My favorite performances in this show come from the consistently superb (and versatile) Strasser, the always solid Earland, and the refreshingly honest Howell. Strasser is creepy in her role as the leader of the troupe (think “Leading Player” in Pippin but even more over the top) but convinced me as a Scottish gravedigger with a limp and a tough as nails detective. Earland is very funny in a short turn as a dumb bartender but is heart wrenching as the troubled teenage murderer in Act Two. Howell, though, broke my heart with her performance. Every time I see her on stage I like her better and this is by far the best I’ve seen her. The lighting design by Ted Weil (Falcon’s artistic director and head honcho) is the best I’ve seen in the space. The sound design, also by Weil and Mercer, sets the tone very well and gives the most dramatic scenes a cinematic feel. Tara Williams costumes are contemporary and fit the overall feel of the show. The minimalistic set is perfect for the style. All of the tech is very well done. I enjoyed Act Two much more than Act One, but that’s because Act Two’s story and themes are the type of thing I’m drawn to. I’m sure that others will like the twists and turns of Act One a lot, too. I also thought some of the comedy – while very funny – was out-of-place . . . but I think this production does its best to deal with the script’s quirks. 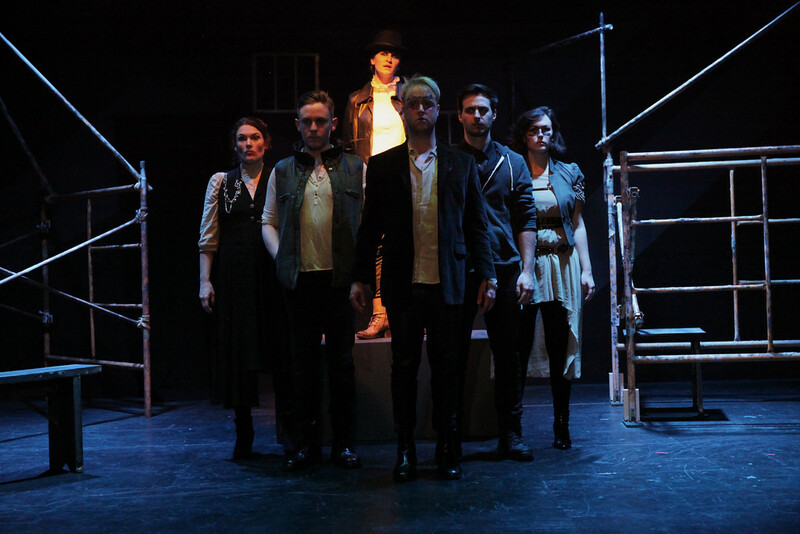 I strongly recommend that you check out THE MYSTERY PLAYS and settle in for a spooky night of solid theatre and fantastic work from some of our cities finest young artists. THE MYSTERY PLAYS at Falcon Theatre runs through November 21st in Newport, KY. Click here for more information or to reserve your tickets.